He and singer Milo Aukerman whose cartoon-y portrait adorns most of Descendents iconography (and an infinite number of tattoos), guitarist Stephen Egerton, bassist Karl Alvarez have made it their mission to remind the legions of fans that have followed in the wake of their massively influential debut LP “Milo Goes to College” （1982）that punk is and will always be dangerous, spontaneous, defiant, fast, emotional and most of all fun. Green Day, Blink 182, Fall Out Boy, A Day to Remember and so many more stadium filling mainstream punk bands have paid tribute to them. Rolling Stone, Spin, NME, Pitchfork and so many more publications have included them on their many lists of TOP punk bands. These guys are the very cream of the crop and for their entire existence, they’ve been just out of reach for fans living in the Orient…until now. 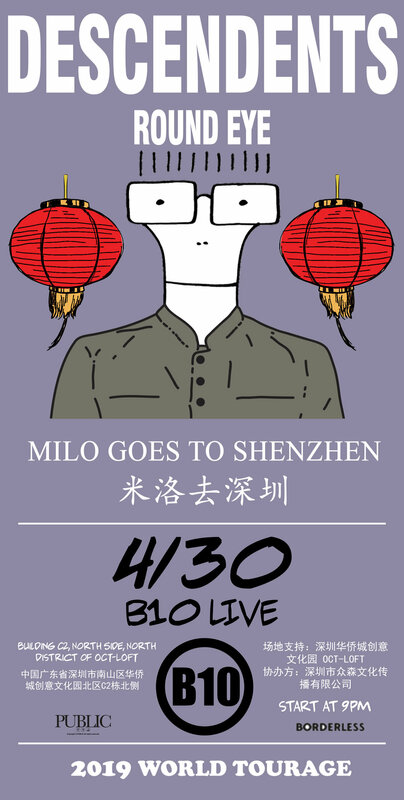 This April, The Descendents will for the first time play in the People’s Republic of China for only 4 nights in 4 cities with Shanghai’s adopted punk sons Round Eye in support. Do yourself a favor, people, and come partake in the rad-age that is THE DESCENDENTS.